12 Questions to help with character development. Critique partners, should I have one? A place for writers to discuss and improve their craft. Happy Friday my lovelies! Thank you for joining us for another #fridayguestinterview. 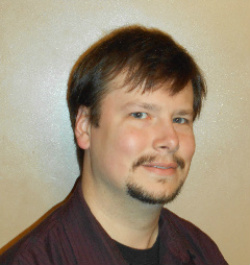 This week I get to introduce you to author Eric Price. I always love doing these interviews. I learn so much and they are always a fun time! So let’s get started. I’ll let Eric tell you a little bit more about himself. Thank you, Kara. My name is Eric Price, and I live in Northwest Iowa. Before I moved here, I lived my entire life within about 45 miles of St. Louis, MO. Both on the Illinois and Missouri side of the river. I started writing, serious writing, in 2005. I sold my first short story, a spooky children’s tale called Ghost Bed and Ghoul Breakfast, in 2008. You are the author of the books Unveiling the Wizards’ Shroud and The Squire and the Slave Master, can you tell us a little about them? 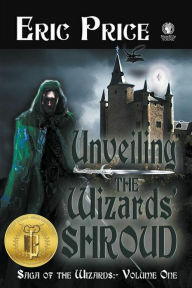 Unveiling the Wizards’ Shroud is a young adult fantasy about Owen, the son of King Kendrick, and his journey to find a great magician to help save his father. He embarks on the quest with a man he hates, the magician he holds responsible for the death of his mother. The party becomes three when Owen’s best friend, Yara, joins them, and they’ll have to survive fantastic monsters, harsh climates, and evil sorcerers to survive. I wrote this book for the 10 and up crowd, but it has been surprisingly well received by adults. 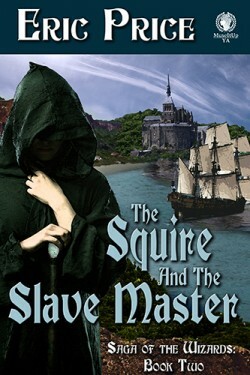 The sequel, The Squire and the Slave Master finds Yara struggling to get through the monotony of everyday life. The dull work of learning her father’s blacksmithing trade, and the pressure from her parents to decide what she plans on doing with her life, has her nerves so stressed she snaps at her father’s slightest teasing. 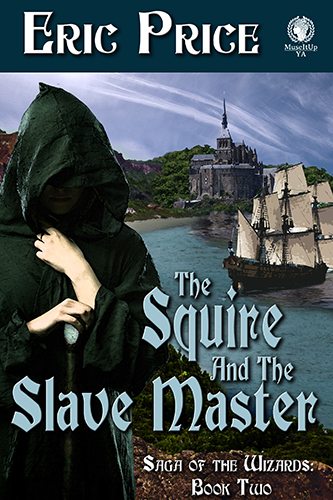 Lucky for her, a surprise messenger from the castle brings the king’s request for her to join a collaborative mission between the Central and Western Domains of Wittatun to stop a recently discovered slave operation in a land to the west. Disguised as a squire, she has to keep secret not only her magical abilities from any possible traitors, but also her gender. The people of the Western Domain have a superstition prohibiting girls from sailing. But a chill wind carries the distinct odor of sabotage. She’ll have to destroy an evil rooted much deeper than mere slavery? The material in this book is slightly more adult than Unveiling the Wizards’ Shroud. A literature teacher at my kid’s school suggested it for readers in eighth grade, or maybe toward the end of seventh. Those sound like excellent adventure tales that people young and old can enjoy! Can you tell us a little about your journey to become a published author? In 2005 I enrolled in a writing course with The Institute of Children’s Literature. Each assignment focused on a particular aspect of writing—plot, setting, description, characterization, etc. One of my assignments became my first published story in 2008 (nothing moves fast in this business). I took a second course aimed at writing books. The finished result for that course became Unveiling the Wizards’ Shroud—after several name changes and a full rewrite. I think all writers are familiar with the full rewrites. It’s a much dreaded word but it’s like running, you hate the torture of the prospect of it but you’re usually glad you did it once it’s over. There’s just something about having a published book. Who was your publisher? What made you decide to go with them? I saw a submission call where they were looking for books aimed at boys. I submitted my book, and they rejected it. On the bright side, they gave me some suggestions to improve it. I had been considering doing a full rewrite, so I took their suggestions and rewrote it. I sent them the finished project and they accepted it. Wow, that’s so awesome! I love hearing all the success stories. They help keep me warm at night after all my rejection letters. Haha. You also won CLC’s Award for Best First Novel can you tell us about that? Literary Classics and Children’s Literary Classics Book Awards and Reviews were created by Taj Mahal Publishing Inc., a division of Wildflower Press and publishers of Mud Pie Parenting Magazine, a Midwestern publication. When the editors of Taj Mahal Publishing first set out to help promote excellence in children’s literature, they discovered the challenges in sorting through all the children’s books on the market. With the increasing number of books being released through the self-publishing market, it became apparent that now, more than ever, parents were in need of resources to help filter through all the books available to children and young adults. Literary Classics Book Awards and Reviews were created for two reasons . . . to help authors gain recognition for their work and to help parents find the best in literature for children and young adults. As far as winning the award, it’s hard to say if it’s had any direct benefits. My publisher is primarily an eBook publisher, and they only give print contracts to a few titles. They gave Unveiling the Wizards’ Shroud a print contract and redesigned the cover with the gold seal, so maybe it helped get my book in print. And that wasn’t your only award, your Twitter profile says you’ve won other awards, can you tell us about them? Before I wrote fantasy novels, I wrote science fiction short stories. Three of them won honorable mention in the CrossTime annual science fiction contest put on by Cross Quarter Publishing. They were printed in anthologies with the other contest winners. Do you have any fun stories you have about writing/publishing that you like to share? The most fun I’ve had comes from meeting students. I’ve been working on a project for over a year now with a high school class in Nantes, France. We’ve had two Skype interviews and they’ve all had an opportunity to read my book. For one of their class projects, they read the first two chapters of my book, and wrote their own version of what would happen next. I posted the results on my website. That sounds amazing! I think interacting with younger writers would be so rewarding! Speaking of young people, I also noticed that you are a member of SCBWI, would you recommend other writers join this group if they are writing children or young adult books? That’s a tough question to answer. I live in a rural area, so it’s difficult for me to get to conferences or group meetings. They do offer a lot of services, critique groups, a book about marketing, contests. I’m going to make a point in 2016 to be as involved as I can to see if it’s worth it for me. If you’re an aspiring author, and you’re able to get to the conferences, I think they have a lot of advantages. They are particularly excellent places to network with agents and publishers, not to mention other authors. Good words of advice. I love picking other author’s brains for words of wisdom. Now that you have a few book publishings under your belt, what’s something you know now that you wish you knew before you started? Write more, promote less. I got so wrapped up in book promotion after my first book came out, it delayed my second book by at least 6 months. Any last pieces of advice you would give to writers who are writing and/or attempting to publish their work? Write your own thing. Don’t try to write the next Harry Potter, or Divergent, or whatever’s popular at the time. Those books have already been written. If you’re going to spend the time and energy, write something original. So very true! Originality is the golden goose that every author should be chasing. Thank you so much for your time and for being a guest on TWP! Can you tell my readers where they can purchase your books? But if you prefer to buy somewhere else, you can find links to most stores on my website. Also, here’s a book trailer for Unveiling the Wizards’ Shroud. Well that wraps up another fantastic interview here on TWP. Eric and I would of course like to thank all of you wonderful readers for stopping by. Don’t be a stranger either, there is new stuff all the time here on TWP whether it’s interviews or helpful posts about writing and publishing. 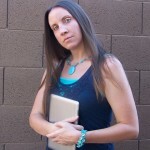 I even document my own journey of writing and publishing that you are welcome to check out. So stick around and come back often. So Close I can Almost Taste it! Kara Piazza is the author of the soon to be released exhilarating novel The Seeker Initiative. Seeker Initiative is her first full length novel and it will be the first book in the series Kara has planned for her protagonists. Kara currently lives in Arizona with her amazing twin boys and her pug Neptune. ©Kara Piazza and The Writing Piazza, 2016. Unauthorized use and/or duplication of this material without express and written permission from this site's author and/or owner is strictly prohibited. Excerpts and links may be used, provided that full and clear credit is given to Kara Piazza and The Writing Piazza with appropriate and specific direction to the original content.